Every bottle is made using only 100% 18/8 medical grade Stainless steel. As our motto is “Zero Plastic”, there are absolutely no plastic parts on our bottle – even our teats and bottle lids are made from silicone! Steel is a very good indicator of temperature-remember: if it is too hot to hold, it’s too hot to drink! Many elements contained in plastic can be dangerous to your baby’s health. Many leading bottle brands include a BPA free alternative and while this is a safer option, it does not address the other toxic and dangerous elements found in plastic. 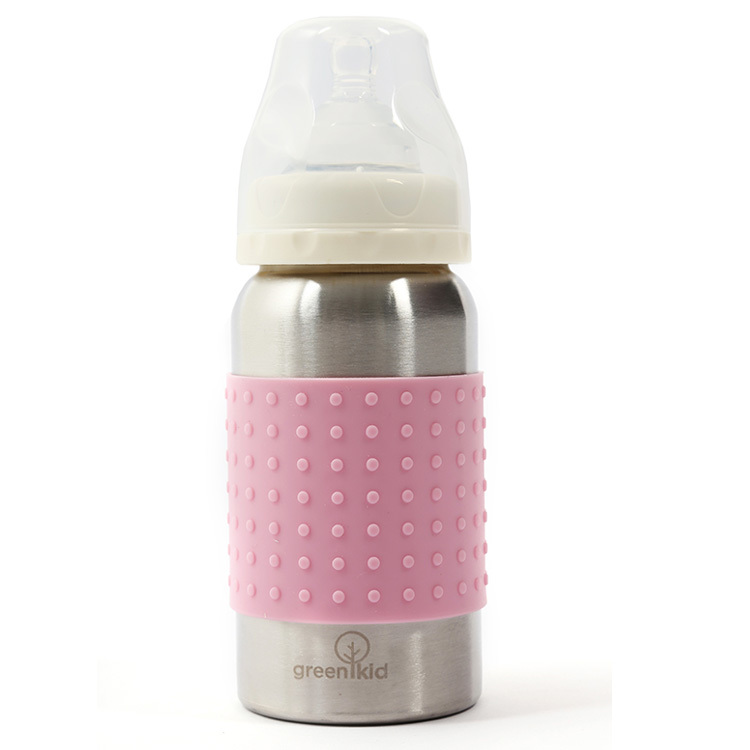 Even BPA-free bottles may STILL leach phthalates and other toxic elements into your baby’s milk, especially when heated, frozen or scratched. Babies and young children are most at risk due to their undeveloped endocrine systems. Stainless steel is the safe, non leaching, non-toxic and durable answer. Bisphenol A is the most common chemical used in plastic and is the main building block in polycarbonate. It is a powerful endocrine disruptor which can mimic the body’s own hormones to an alarming degree. Many bottle brands misleadingly advertise as being BPA free. To meet European BPA free standards there only needs to be a LOW level of BPA and not a total removal. This is truly an offense on the unwitting consumer. * Please note that there are bottle brands that truly are 100% BPA free. Infants and children are believed to have the highest daily intake of BPA due to the use of plastic baby bottles, sippy cups and plates. Effects on infants and children may include obesity; early onset of puberty, inadequate brain development and behavioural issues. Breast tissue development in Boys, increased risk of breast cancer in Girls, prostate cancer and erectile dysfunction has also been attributed to this nasty chemical. Starting in 2008, several governments questioned the safety of this compound, prompting worldwide scientific research into the effects of BPA. A 2010 report from the United States Food and Drug Administration (FDA) raised further concerns regarding exposure of foetuses, infants, and young children. In September 2010, Canada became the first country to declare BPA a toxic substance. In the European Union and Canada, BPA use is banned in baby bottles. South Africa has now followed suit. Phthalates are chemical plasticizers used to soften plastics that would otherwise be brittle and crack when bent. Because phthalates are not chemically bound to the plastics they’re added to, they’re continuously released into the air, food or liquid Studies show that there is potential for phthalates to lower sperm production and cause anatomical abnormalities related to the male genitalia. There has also been a suggested link between phthalates and asthma, timing of puberty or the risk for childhood obesity, among others.